I’m posting from my old PC laptop as my iMac had coniptions yesterday and decided to go slooooooooooow and then freeze up! It’s now awaiting the ministrations of the computer doctor and hopefully will be fixed by next week. However, when I started this blog on 11th April last year my goal was to post every day so I’m hoping that I can stick to that. 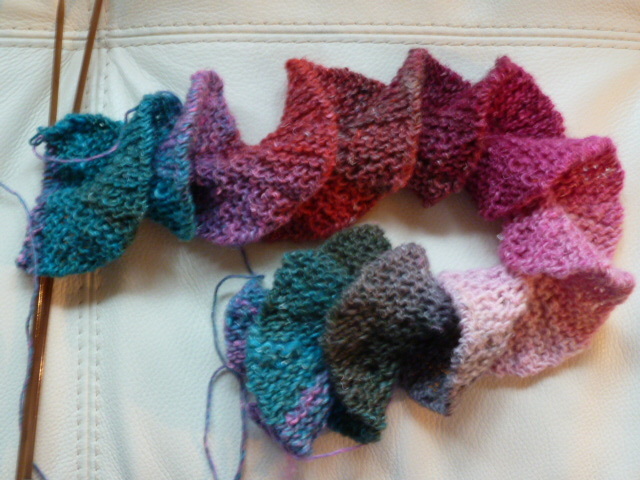 I’m back to knitting another twirly whirly spiral scarf using the yarn I bought at the Cobbity Market wool stall. Here’s my progress so far. 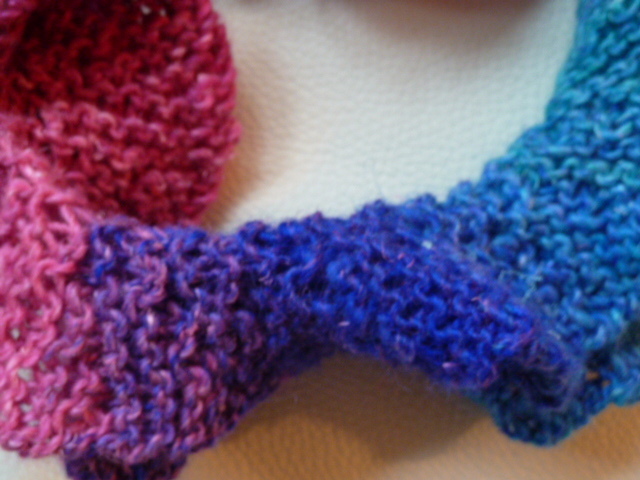 This yarn knits up so prettily. It has the same colors as my last one except that it’s missing the deep blue and purple shown here. I’d really like to know the directions you used for the Spiral Scarf. I checked the patterns you suggested and none seem to be the same. I like that there are comparatively few stitches on the needle and that the colors then change so subtly. Most of the patterns used many stitches on a circular needle and the colors would “muddy”. Can you help? I used a generic pattern where you work out for yourself how many stitches you want and apply a mathematical formula. However, the pattern below uses the results of that generic pattern for two stitch numbers (19 – the number I used and 21).